Sean Rafferty presents music from Jeremy Denk and the Calidore String Quartet. And we talk to Syrian-Palestinian pianist Ahmad Aeham about his memoir: The Pianist of Yarmouk. Live music today comes from pianist Jeremy Denk ahead of recitals at Wigmore Hall and Perth later this week. We also hear from the Calidore String Quartet who take part in the Tetbury Chamber Music Festival which runs from the 22nd to the 24th March. 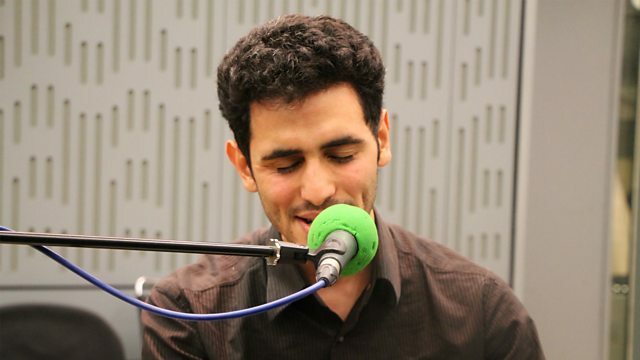 And Syrian-Palestinian pianist Aeham Ahmad became known after he dragged his piano in to the rubble of the bombed out streets of his neighbourhood of Yarmouk near Damascus; he joins us in the studio ahead of the publishing of his memoir: The Pianist of Yarmouk. Performer: Maurice Steger. Orchestra: La Cetra. Ensemble: Vienna Chamber Symphony Quintet. Ensemble: Tallis Scholars. Director: Peter Phillips. Singer: Philippe Jaroussky. Ensemble: Ensemble Artaserse. Singer: Edita Gruberová. Conductor: Nikolaus Harnoncourt. Singer: Peter Keller. Orchestra: Philharmonia Zürich. Conductor: Jaap van Zweden. Orchestra: New York Philharmonic.